Authorities in Chile held a 3 hour long meeting on July 31st 2014. The UFO-issue was discussed and several experts and pilots attended. One of the conclusions was that the UFO-phenomenon does not pose a threat to civilian and military air traffic. 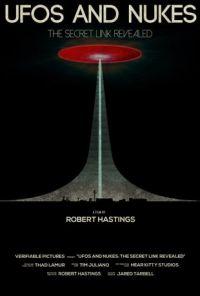 Furthermore there was a general accept of the reality of UFOs. We encourage the Danish authorities to move in the same direction as Chile. The latter is in our opinion a frontrunner and Denmark should engage in a dialogue and information sharing with Chile, France, and a few other countries that are "ahead". Read journalist Leslie Kean's article about the meeting in The Huffington Post. The German blogger Andreas Müller has apparently gained access to previously classified UFO documents from the German Secret Service: BND (Bundesnachrichtendienst). 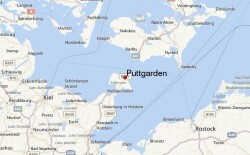 They contain information about an interesting UFO case from Puttgarden habour in 1986. A large part of the material (67 pages) is however concerned with episodes which took place near the border to Warsaw Pact countries during the Cold War. Several of the cases can be explained away as e.g. Soviet spy balloons. Read a a summary of Müller's article in English. 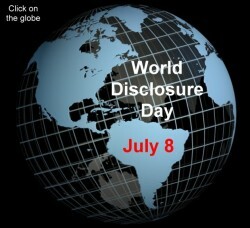 July 8th is World Disclosure Day. 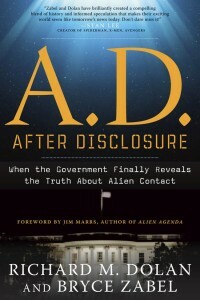 It an awareness day created to draw attention to the political activism of getting world governments to disclose an extraterrestrial presence on Earth. World Disclsoure Day is promoted by Paradigm Research Group (PRG) in the United States. PRG was also behind the Citizen Hearing on Disclosure in 2013. You can endorse the initiative by giving an electronic signature on World Disclosure Day's website. The awareness day lies in the slipstream of the World UFO Day on July 2nd. Visit World Disclosure Day's website.